Use our interactive sky map HERE to find out if you can see Mercury right now! 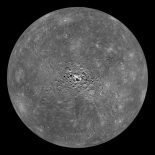 Be careful when viewing Mercury if it is close to the Sun. The Sun can damage your eyes so ensure it has not risen before attempting to view Mercury. Never look at the Sun through a telescope without using a special solar filter. Even catching a quick glimpse of it whilst searching for a nearby planet could cause irreparable damage. Mercury is the smallest planet in the solar system and is the closest to the Sun. The surface of Mercury is covered in craters similar in appearance to our Moon. No fancy equipment needed to view Mercury, it can be seen with the naked eye! A decent pair of binoculars will allow you to get a better view, but due to it's size you won't see much detail. Take a look through a small telescope and you will be able to see the different phases of the planet (just like the phases of our Moon). Mercury can't be seen this month, it lies too close to the Sun. Click on this box to upload them to the website!